The teaching of games is a central component of any physical education or youth sport programme. Contemporary Developments in Games Teaching brings together leading international researchers and practitioners in physical education and sports coaching to examine new approaches in games teaching and team sport coaching that are player/student-centred and inquiry-based. 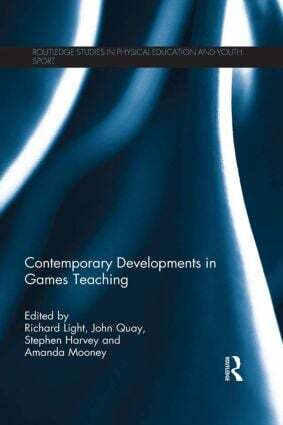 The book aims to bridge the gap between research and practice by exploring contemporary games teaching from pedagogical, policy and research perspectives. It offers interesting new commentary and research data on well-established models such as Teaching Games for Understanding (TFfU), Game Sense, and the Games Concept Approach (GCA), as well as introducing innovative and exciting approaches emerging in East Asia, including Singapore, Japan and Taiwan. Representing the most up-to-date survey of new work in contemporary games teaching around the world, this book is invaluable reading for any student, researcher, in-service teacher or sports coach with an interest in games teaching or physical education. Richard Light is Professorial Research Fellow in Human Movement in the School of Health Sciences at the University of Ballarat, Australia. John Quay is Program Director for and lecturer in Pedagogy, Health and Physical Education at the Melbourne Graduate School of Education, Australia. Stephen Harvey is Principal Lecturer in Physical Education and Sport at the University of Bedfordshire, England. Amanda Mooney is Program Co-ordinator for the Bachelor of Education (Physical Education) and lecturer in the School of Health Sciences at the University of Ballarat, Australia.